Good marrow, explorers. Yes, marrow, not morrow. Pass me one of your juicy bones. One of the events that can lead to combat. Today is the day for a larger update to make amends for the meager offerings I served up last week. Strap yourselves in. Much has happened. So much that to make this post readable I had to introduce a HOT NEW blog feature – subheadings! Now that I’m a full-time indie dev, I’ve founded a proper company. It’s called Pixel Trickery. It’s just me. I’ve always thought that most forms of entertainment are elaborate tricks played on the audience, tricks which make ink or paint or vibrations in the air into something that briefly communicates emotion and meaning. The very best kind of trickery goes even further – audiences love a good plot twist, they love subtlety and subtext and hidden depths of meaning, they love authorial sleight-of-hand, because ultimately audiences love being tricked. And you know why? Because fiction works best when it tricks you into forgetting it’s fiction. Writers are ink tricksters, artists are paint tricksters. Game developers are pixel tricksters. Anyway, that’s the meaning behind the name. I’ll link to this in the future if anyone bothers to ask. I’ve always been open about the fact that A House of Many Rooms owes a great debt to Sunless Sea. The setting and world are different, and so are many of the mechanics, but there are a bunch of similarities. Ultimately Sunless Sea (which everyone should buy right now, by the way, if it’s not in their games library yet) is the best RPG since the days of Planescape: Torment and Baldur’s Gate, and if it isn’t massively influential on more games than just my own, there’s something very wrong with the world. 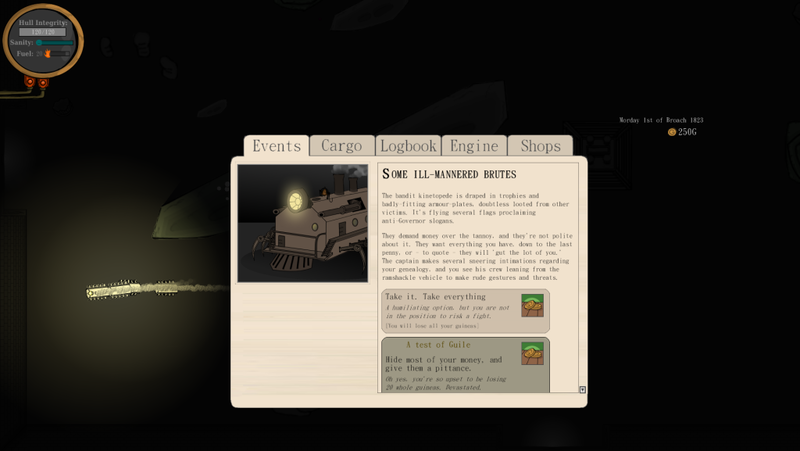 Anyway, turns out Failbetter noticed that post, and apparently they quite liked the look of my game too. So – in a demonstration of their characteristic niceness and loveliness – they invited me to visit their offices in London! Me with Failbetter and friends at the pub after work! Their lair – sorry, office – isn’t located ‘beneath a volcano.’ Have you seen a volcano in London lately? Their lair is located on top of a subterranean volcano, which is safely prevented from eruption via extravagant ritual sacrifice. The extent of their organ-harvesting operation has been greatly exaggerated, and is really only limited to children from the local orphanage and the occasional recruitment consultant. The rumours of their moon-mounted world-ending omega-cannon are completely false. The cannon is sensibly located on Mars, to avoid expanding waves of debris from the shattered Earth. As well as providing these useful insights, my time at Failbetter was great for a whole host of other reasons – they’re really an exceptional and unique company, and despite being extremely busy they were happy to speak to me and provide a bunch of super-useful advice about my game. 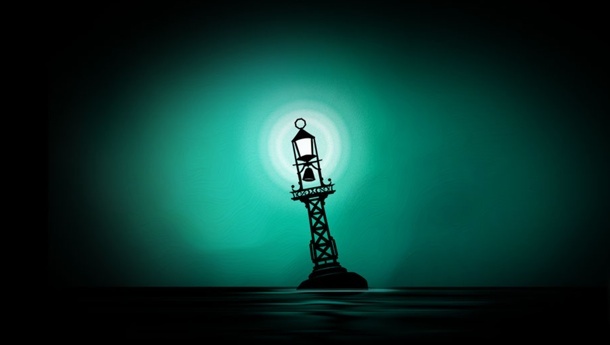 I also got to rave about Sunless Sea a little, although I tried to keep a lid on it because I do have a tendency to be overly effusive about things I like (see: Tom Francis reluctantly linking my blog post about him last month). And even better? 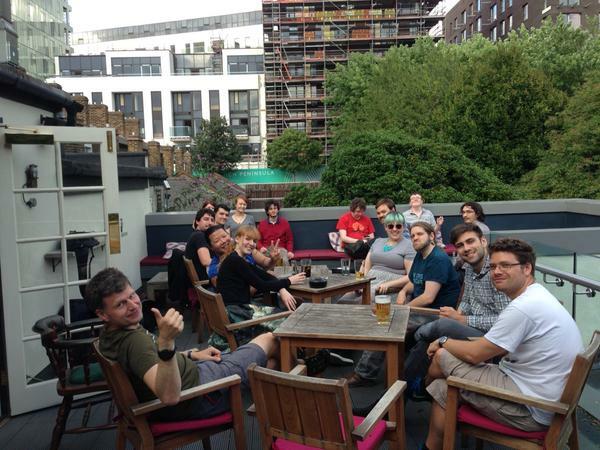 Failbetter has a lovely environment with a great view and friendly chatter and a comfortable atmosphere, and it turns out that this sort of thing is very useful for getting work done. I sat in the corner and coded merrily away on my laptop, and I got a lot of work done on the game! I’m returning to the Failbetter offices next week, and hopefully this will become something of an ongoing thing. They did feed me a lot of fudge, though, and I suspect they are fattening me up, so if you don’t hear from me again rest assured that I have at least been a useful source of calories to a delightful company. That’s right! My video game! I’ve been busy, but I’ve managed to get a bunch of things done on A House of Many Rooms this week, mainly combat-focused. Combat Month is coming to a close now, and I’m pleased with the progress I’ve made – all the essentials are in, and although there are a few features that still need to be added, combat is in and working and fun to play. So what did I add? 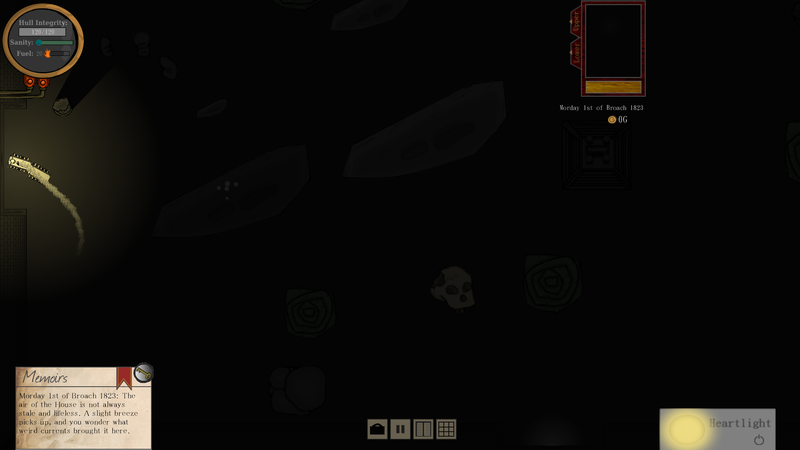 Well, firstly, the player can now pause combat at any time and issue commands. That’s right! Real time with pause! This was a lot of work but it’s pretty unexciting so let’s skip to the next thing. It makes taking screenshots easier. The enemy crew are now wearing clothes, and after the Great Trousers Debate of 2015 I’ve also made sure that their clothes stay the same even after the enemy flee, combat ends, and then you chase them down and re-initiate combat. This was more effort than it sounds, but keeping the colour of trousers constant is a principle that I will die for. Enemy crew also now have individual HP and Sanity bars – just like your own crew – and their HP is damaged if they’re hit by an explosion from the player’s artillery fire. 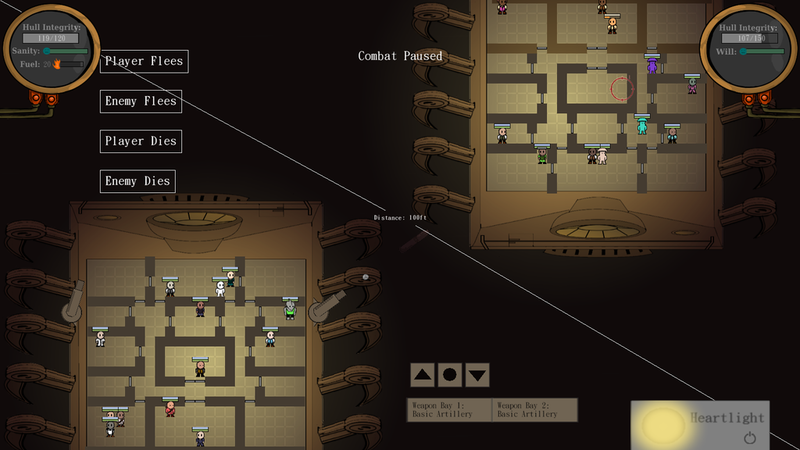 More interestingly, their Sanity is damaged if another member of their crew is killed within their line of sight – low Sanity will have interesting and debilitating effects, which means that a potential (horrible) tactic for defeating high-HP enemy crewmembers, like a Guard Captain, will be to messily kill weaker crew nearby until the Guard Captain goes insane with grief. Er… fun! This wasn’t intentional – I didn’t set out to make this a viable tactic. This is just a few different systems coming together for an intriguingly horrifying result. And bear in mind that the enemy can use this tactic against the player as well. 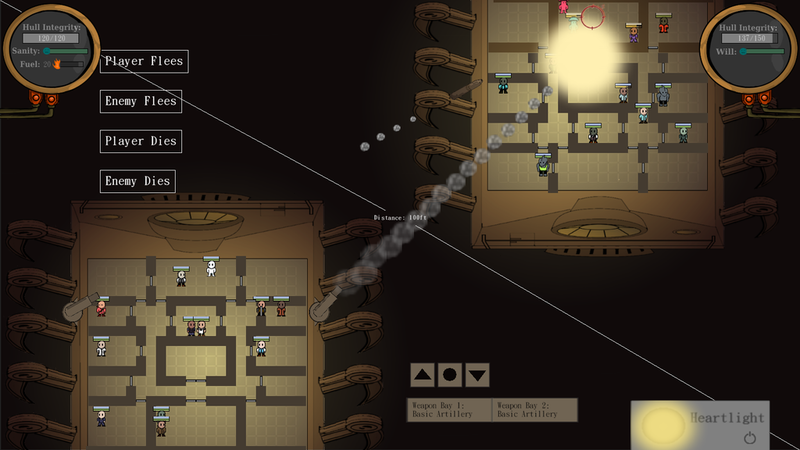 Speaking of tactics the enemy can use against the player, I’ve also added enemy targeting and firing! Battles have gone from being one-sided snooze-fests to incredibly quick barrages of fire that end almost instantly with either the player or the enemy dead. Here’s a very quick, chaotic gif of a typical exchange of fire. I need to make what’s happening a little bit more readable to the player – right now it’s complete chaos. But more on that next week! As ever, please check out my Twitter – now with a new username! It’s @pixeltrickery now! That’s the name of my company! I have a company! How did that happen! ?